High quality implant components for optimized production of implant-based parts. With a harmonized system consisting of hyperDENT® Implant Components and software, FOLLOW-ME! 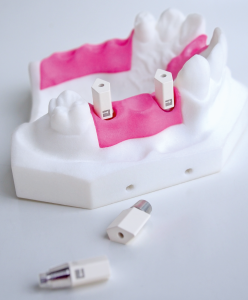 offers the ideal solution for a professional implantology workflow. The high quality scanbodies are very easy to handle and are compatible with all established lab scanners. Each scanbody is equipped with an integrated screw, which eliminates the risk of screw loss, and all components are suitable for hybrid as well as pure milling. High-precision machining with a very narrow tolerance range is guaranteed by the optimal component design and test routines such as simple position recognition and exact alignment of the implant. 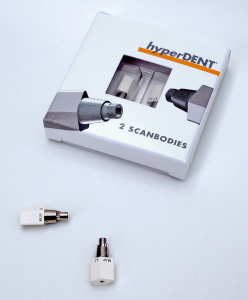 Due to the high degree of accuracy, the hyperDENT® Implant Components are also optimally suited for scanning implant bridges. An optimal workflow in just a few steps. Have you installed the necessary CAD library? Have you purchased the CAM library and hyperDENT® license? An update of an existing hyperDENT® license is required. Do you have the hyperDENT® Screwdriver? If not, this can be ordered at any time. Please select the implant components under “Product Catalogue” and fill out the form under “Selected Products” including your personal details (first and last name, company name, email address, telephone number, hyperDENT® license code (if available), personal message (if needed). The FOLLOW-ME! Team will process your request as quickly as possible and send you an offer including shipping costs. Once you have confirmed the offer, you will receive an order confirmation and invoice (to be paid within 14 days). The products will be sent after payment has been received. The FOLLOW-ME! Team is here to answer any questions your might have during the order process.